Winter in the North East is quieter for gardeners than other seasons, and many of us revel in the downtime by reading our ecology and gardening books. 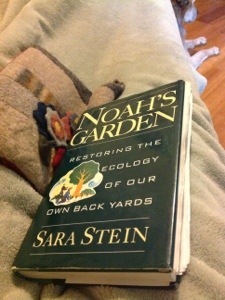 The quintessential handbook on ecological gardening is, inarguably, Noah’s Garden by Sara Stein. She published this fine volume in 1993, and it was absolutely engineered by a pioneering mind. 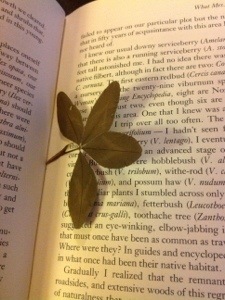 Her book is often the jumping off place for especially observant gardeners. I first read Noah’s Garden in 2004, and re-read it over the holiday season this year. This blogpost will in no way come close to doing the book justice in the way of a review, (and friends, please weigh in on what you like about Noah’s Garden) but I wanted to note some things that gave me extra pause. The decision to re-read occured in the middle of a conversation with Carole Sevilla Brown about the book at a conference this autumn. My interior world is that much richer for re-reading Noah’s Garden, and I am astonished at the degree to which I see the book’s contents with new eyes, from 2004. Highlights from the book include: a wonderful reference list of other books to hunt down and edify my mental sphere with. I have acquired, thanks to Sara Stein’s suggestions 20 years ago several titles, including A Gentle Plea for Chaos, by Mirabel Osler, How to Know the Wildflowers and According to Season by Mrs. William Starr Dana. 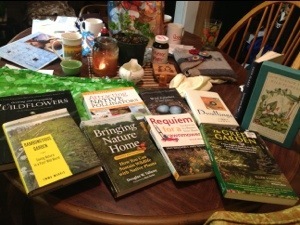 I will read them as soon as I finish The Green Garden by Ellen Sousa and The Sand County Almanac by Aldo Leopold. There are so many wonderful books; the trick is to round them up in one place and allocate time to absorb their goodness! Another takeaway lesson from Sara Stein’s book that stuck out was her assertion that it’s mandatory we integrate native plants into our garden scheme because they are the base of the food web. I don’t ever think of something like Asclepias tuberosa as food. But I belong to the elaborate system of a local ecology whichs connects in a weaving pattern, native plants to pollinators and herbivores, headed up by carnivores, but the delicate balance (in ways we can’t imagine) is upset if any category is too plentiful or sparse. I noted a specific trend in Sara Stein’s writing that begs us for biodiversity. Each type of ecosystem must be considered, and of the hundreds and hundreds of species of native plants, if many of us are welcoming different kinds into our respective properties, we can pull together as a lovely patchwork quilt, different pieces supporting all the wildlife that need to find habitat. And wildlife corridors will naturally evolve, offering hope for every species our ecosystemic community’s survival. And last- from me- certainly there is lots more to say about Noah’s Garden, I am struck by the author’s courage. It’s empowering to read her memoir-esque tale of transforming an invasive species weedy field into a wildflower meadow, over the course of 3 years. Or as she attempts to re-populate her rebuilt wildlife pond with frogs and newts, and the obstacles she encounters and deftly processes- with a head full of ecology and gardening sense- and squarely faces in what seem to be brand new methods at the time of writing. Born of creativity and heart! We can impact our natural world in a lasting and positive way if we tune into the right frequency because we are intrinsically a part of this natural world. Noah’s Garden forever links ecology and gardening in a new marriage whose time has come.